Habit: Perennial herb, subshrub, emergent aquatic, 3--20(40) dm, matted, with thick white spongy roots at floating nodes, creeping to erect on land, often climbing on other pls. Stem: prostrate to erect, flower shoot erect, simple or branched distally, glabrous (floating) to spreading-hairy (erect). Leaf: alternate, 3--11(15) cm; petiole (0)5--30(56) mm; blade narrowly elliptic to oblanceolate or widely obovate, entire, +- glabrous, tip generally mucronate. Inflorescence: bracts lanceolate to lance-ovate; pedicel (9)13--25(85) mm. Flower: sepals 5(6), 12--19 mm; petals 5(6), 18--29 mm; stamens 10(12) in 2 unequal sets, anthers 1.5--4.5 mm. Fruit: reflexed, falling with pedicel; 14--26 mm, cylindric, tapered to pedicel, +- spreading-hairy. Seed: 1.2--1.5 mm, embedded in woody inner fruit wall. Chromosomes: 2n=80. Ecology: Lake margins, wetlands; Elevation: < 300 m. Bioregional Distribution: NCo, s NCoRO, GV, CCo, SnFrB, SCo; Distribution Outside California: Oregon, Washington, southeastern United States (native? ), Central America, southern South America, Europe. Flowering Time: May--Dec Note: Invasive weed. 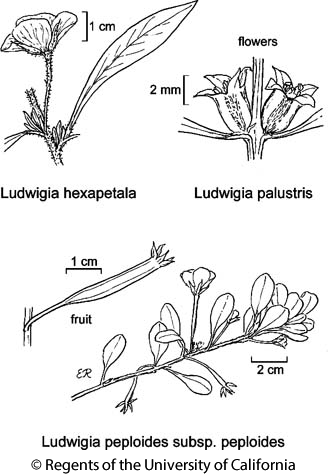 Citation for this treatment: Peter C. Hoch & Brenda J. Grewell 2012, Ludwigia hexapetala, in Jepson Flora Project (eds.) Jepson eFlora, http://ucjeps.berkeley.edu/eflora/eflora_display.php?tid=31665, accessed on April 24, 2019. NCo, s NCoRO, GV, CCo, SnFrB, SCo; Markers link to CCH specimen records. Yellow markers indicate records that may provide evidence for eFlora range revision or may have georeferencing or identification issues. Purple markers indicate specimens collected from a garden, greenhouse, or other non-wild location.